An Eden Hazard double was enough to give Chelsea a three points that gives them a giant step towards the title, and puts surely a final nail in City’s title hopes coffin. Unfortunately a familiar pattern re-occurred tonight, as Guardiola’s side caused Chelsea all sorts of problems in attack, but were let down and ultimately punished via poor defending. Just like Spurs, Leicester and Liverpool away, City were behind and chasing inside the first ten minutes. Eden Hazard couldn’t believe it when he found himself in so much space in the box, but his goal came following a slice of luck via a deflection coupled with questionable goalkeeping from Caballero. Delph, who was a surprise inclusion, did well to recover but Fernandinho and Kompany were too slow to react and Hazard fired Chelsea into the lead. From one goalkeeping error to another, at the other end Thibaut Courtois miss-placed a clearance to David Silva. It looked like Silva had squandered the chance with a poor shot on goal, but Agüero was in the right place at the right time, as he always is, to tap home and equalise for City. After patient build up play and a touch of luck City were level, but it only took a matter of minutes for all of it to be undone. Mike Dean pointed to the spot after a silly foul from Fernandinho that he didn’t need to make. 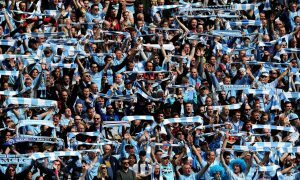 There were no valid complaints from the City players or fans. Hazard’s penalty was saved by Caballero, but a smart rebounded attempt was enough to restore Chelsea’s lead. Courtois somewhat atoned himself for his early mistake, with smart saves to deny Sané and Silva late in the first half. Chelsea went into the break with the lead and from this point on the game played into Conte’s hands. He elected to send on Matic at the break to sit alongside Kante, who both sat behind the ball and stopped City’s creative players to find spaces. City dominated the ball in the second half, as they did before the break, and attempted to pick Chelsea apart. The home side barely got out of their half, but Conte was more than satisfied, as City failed to really work Courtois. The best two chances of the half came from similar positions. First, Delph picked out Fernandinho in space who hammered over the bar from close range – perhaps distracted by thinking he was offside. The second, and perhaps the best, fell to John Stones, who was solid again tonight. He found himself in space from a set piece but a slight deflection caught him off guard and Stones shanked his effort into the stands. Silva, De Bruyne et al tried and tried all night to find gaps in the Chelsea back five, but it wasn’t to be. City were often forced into shooting from distance but Courtois wasn’t going to be beaten from range. Overall, again it was a game that summed up Pep’s first season at the club. Chelsea weren’t amazing tonight, but it was an industrious approach, the sort of performance that will win Chelsea the league – prolific on the attack and defend as a unit. Nights like tonight sum up the season, as it feels like City need four or five clear-cut chances to score one goal, whereas only one or two chances at the other end to concede a goal. From all negatives come positives however. A number of players for City stood out tonight – Silva was excellent, and Fabian Delph definitely deserves a mention for great energetic work on and off the ball. No player deserves more of a mention however than Vinnie Kompany, who looked brilliant next to Stones, but lets not get carried away as it is only 90 minutes completed and there is still a long way to go in terms of proving Kompany’s fitness. As for the bigger picture, it is frightening how good Pep’s City side could be with a few defensive signings in the summer. The defence has cost us the league this season, along with missing big chances in big games, but the latter is something that will come with perseverance. City host Hull on Saturday, which will not be an easy game by any stretch of the imagination. Marco Silva’s side will travel to Manchester on the back of a massive confidence-boosting win against fellow relegation strugglers Middlesbrough.